It’s not uncommon to start off the new year with the urge to declutter your space, and purge unwanted items. 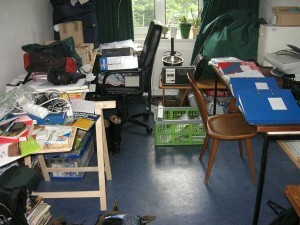 In fact, I think it’s a great idea to rid yourself of unwanted and unused items that are taking up space in your home. But, if you’re going to go to all the work of sorting through your things, most of which probably have value, you might as well try to make a little money on the side while you’re at it. There are numerous websites that you can utilize to sell your unused items, and below I’ve listed a few of the most popular. Selling on Craigslist is very simple, and you can list just about any item on Craigslist, too. Craigslist is a great option for large items as you don’t have to worry about shipping costs. The most commonly sold items on Craigslist are cars, furniture, real estate, baby and children’s items, and event tickets. Craigslist is a free service, so you don’t have to worry about paying a fee to sell your stuff. However, after you list your item for sale you are responsible for responding to inquiries and setting up the transaction details yourself. The ease and convenience of Craigslist makes up for any odd or awkward moments you may encounter while making a deal. In these trying times, people can use all the extra cash they can get. If you are like the rest of us that are struggling to make ends meet, or you just simply want to upgrade your smartphone, then below are some great tips. As a bonus we found some additional information from a blog post where you can read about great tips on how to make money fast. 1. Recycle Bottles, Cans, and Containers. Make some cash off the products you already buy. Not only will recycling bottles and cans pay cash dividends, but you will also feel great about helping the environment while doing it. Depending on the state in which you live, a bottle and can deposit system may be able to give you as much as 5 to 10 cents per container, which can quickly add up. If you would like to see the cents add up even faster, try collecting bottles and cans after a party or event. 2. Sell Your Unused and Unwanted Items. By selling your unwanted stuff (or junk), you will not only gain financial profit, but also possibly lose a great deal of unnecessary clutter. Antiques, old toys, instruments, CDs, or even clothes will all have a buyer if you look in the right place. For quick unloading of an item locally, post the piece along with some well taken images and a good description to Craigslist. Craigslist is an ideal market for your everyday items, such as old baby furniture or even boxes of clothing. If you have clothes in good condition that are simply no longer needed, clean and organize them by size and put them in a box or bag to be sold on the site or to a friend for a flat fee. EBay is recommended to auction off collectibles and antiques. 3. Donate Your Plasma for a Good Cause. With a simple process that is similar to drawing blood, you can be compensated for your time spent donating plasma to those who desperately need it. These sums are paid in cash and the process takes usually around a couple of hours at the most. Some donation centers offer as much as $50 for first time donors and may allow you to donate up to twice a week. 4. Scrap or Recycle Your Tech Items. Whether you have an unused, broken computer or an outdated cellphone, these items are worth cash. There are often shops dedicated specifically to this market. Computers can be scrapped for their valuable metals, while out-of-date cellphones can be recycled.